Whether you’re a newly married woman or you lost your valid IDs and you need to have one as soon as possible, applying for a Postal ID in the Philippines is the next best thing to do. Why? Because it’s very simple to apply, it’s affordable and you can have it in a month or less. The new postal ID is already considered as a valid ID and it’s now widely accepted in various establishments and government offices. Who are eligible to apply for Postal ID? The application of Philippine Postal ID is open to all Filipino living in the Philippines and living abroad. To apply for Postal ID, you need to personally go to the Post Office here in the Philippines. Foreigners are also welcome to apply for Postal ID as long as they have been living in the country for at least 6 months. What’s new with the improved Postal ID? 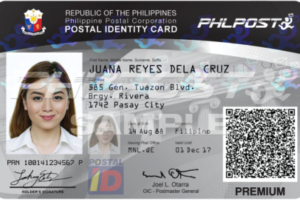 The new Postal ID has additional physical security features including a hologram, QR code and unique biometrics that makes it more reliable and guarantees the identity of the individual owner. How much is the new ID? It costs Php 504 to get the new postal ID this 2017 that includes Postal ID Card and Delivery Fee (P450) and 12% VAT (P54). How long is the validity of the Postal ID? It is valid for 3 years for Filipinos and for foreign residents with Special Retiree’s Resident Visa (SRRV). For the rest of the foreign residents, it will be valid for 1 year only. For married females, you need to bring original and photocopy of your marriage certificate. Download 2 copies of Postal ID Application Form and fill out the required info. You can also get this form at the Post Office. After your documents are screened, you will proceed to the ID capture station to be photographed and fingerprinted. You will be given a receipt or a stub with the estimated delivery date of your new Postal ID. Click the link below to see the list of Post Office locations with Postal ID capture stations. Aside from you can use it as a valid ID in various transactions, you can also avail of discounts, product/service upgrades, freebies, and other exclusive deals at different merchant partners across the country. Some of these privileges can be availed while dining at restaurants, staying at hotels or resorts, visiting theme parks, shopping for appliances and other products, or availing services in salons, spas, clinics, fitness centers, training schools, etc. Click here to see the complete list of privileges that you can get with your Postal ID. May i know what is the direct line or contact number of philpost? parang the same lang, pero ask ka na din sa barangay hall kung magkaiba ba to at kuha ka na lang kung ano kailangan to apply for new postal id.